Earlier this week we published an article about Turkish PM Erdogan's repeated comparison of Israeli PM Netanyahu to Hitler. His calculated provocation and polarization during his electoral campaign to become the country's president for the next seven years appears to be symptomatic for the inner world of Turkey's most powerful leader since Mustafa Kemal Atatürk. A recent interview provides further insight on how he thinks about ethnic and religious minorities, which always were and are an essential part of Turkey's population. 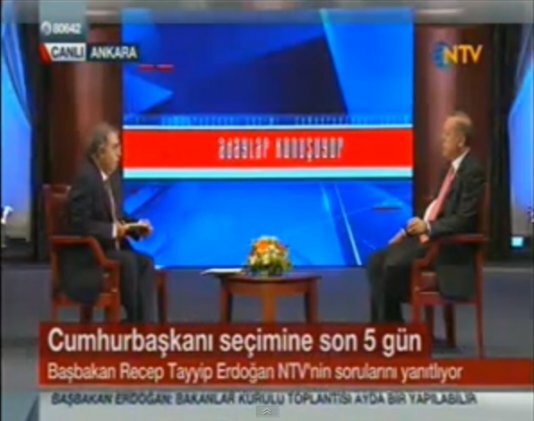 On August 5, Erdogan was interviewed on Turkish news channel NTV. When the interviewer asked him about the allegation that he is trying to polarize Turkey's multi-ethnic and multi-religious society with his statements, Erdogan said he considered it an improvement that every member of any ethnic or religious community can now openly say to which group she or he belongs. In the course of his long winded answer he mentioned that his ancestors had a Turkish background, but also that different ethnic backgrounds were persistently attached to him by others: "Some people said I was Georgian or, excuse me, even much more nasty: Armenian. However, what I know from my father and my grandfather is that I'm a Turk." Interestingly, this scene doesn't only reveal how Erdogan thinks about the ethnic minority of Armenian people who are actually Turkish citizens - just like him, it also depicts the compliance of the NTV journalist. Wouldn't a journalist immediately ask why Erdogan considers being of Armenian origin to be something nasty? The journalist's indifference leaves you also with the question why the presidential candidate thinks that being of Armenian origin would worse than of Georgian? And why only these examples? Because they're typically non-Muslim but Christian? As a spectator of that scene you might think: Is he really aware of what he is saying in that moment? Was it a slip of his tongue or is that his usual audacity to provoke, offend and incite people? To humiliate his own Turkish citizens whom he his intending to represent as their future president? It's Erdogan's perfidious attitude to claim that minority rights have been strengthened through his government's reforms on the one hand, and to defame these citizens on the other hand. His persistent attitude plays on the precarious line between the denominators of a modern society and revisionist politics. It's a deceiving balance: most of his government's reforms are of cosmetic nature, and don't even touch the core of democratization. They are actually designed through opportunistic laws and constitutional changes to strengthen an autocratic-type rule shaped by a one man show, supported by a religiously driven majority and economic profiteers of his regime. According to current opinion polls, 56% of Turkey's citizens will vote for his presidency. Yes, there bas been socio-economic mobilization throughout the last decade, however, a significant portion of this vote is carried by a multiple complex, which the Turkish majority obviously hasn't overcome: the absent Muslim Empire versus the secular Republic, which would require civil maturity instead of a fan club-like fellowship. It is a vote pro revisionism, contra modernism. It's the empowerment of their leader's one man agenda, which hovers above the principles of a modern democracy.